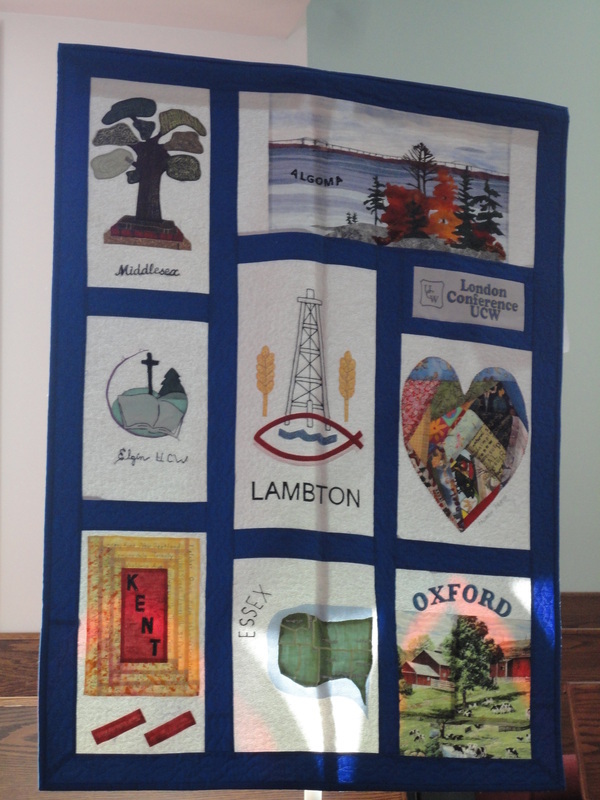 ​sharing her work with Canadian Aid for Chernobyl. 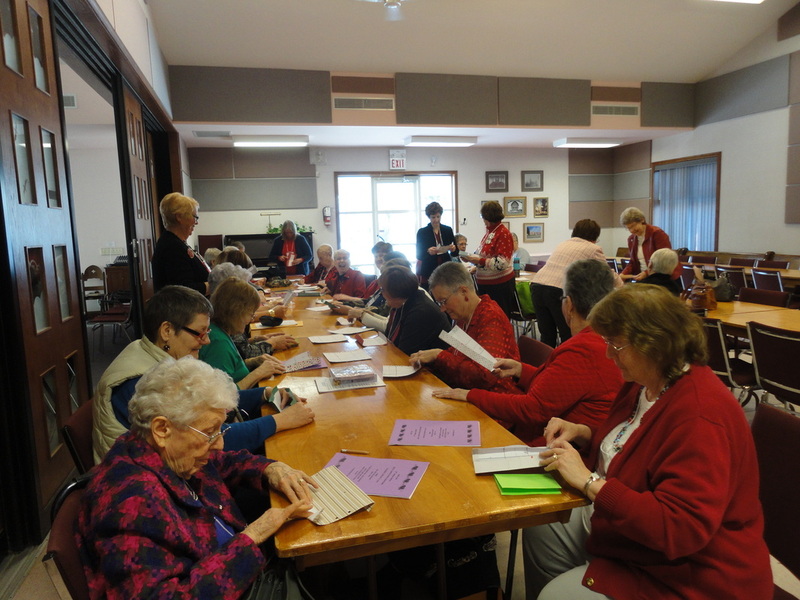 Registration at 11:30 a.m. with lunch to follow at noon. 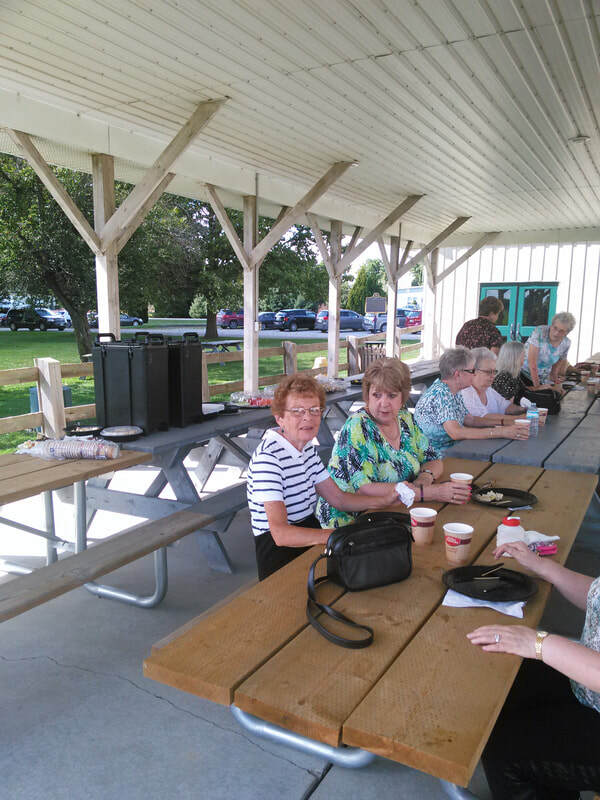 After an informative program and brief worship we had lunch, catered by Burns Restaurant in Dresden, in the pavilion. 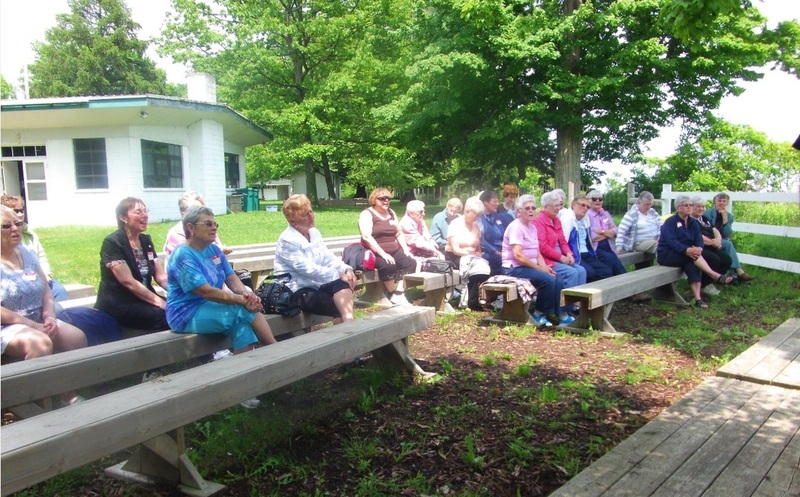 The weather was perfect, the tour interesting and the lunch delicious which made for a most enjoyable day. 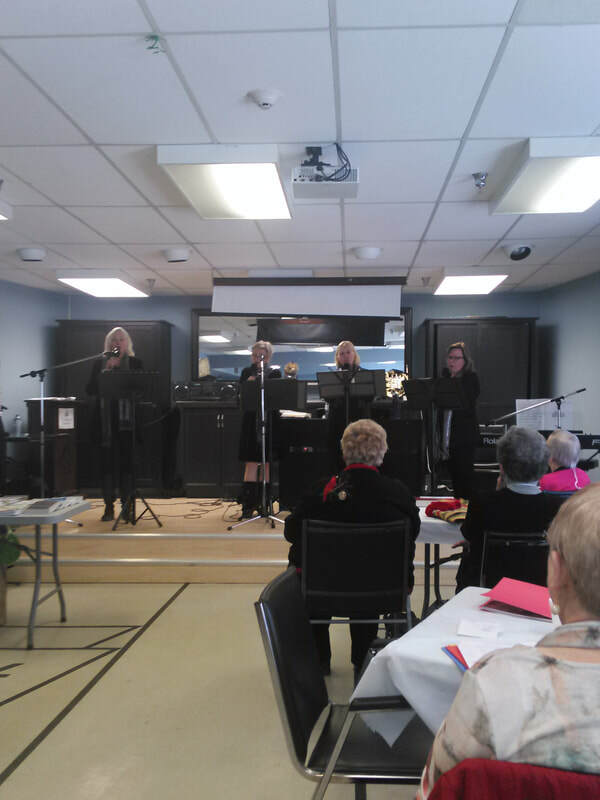 on Saturday, April 7, 2018.
entertained us with their singing and musical accompaniment. 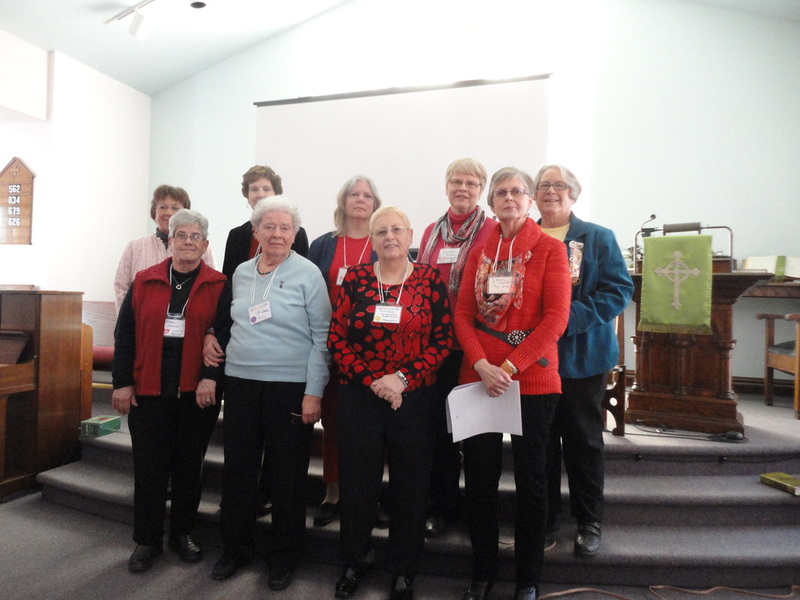 Kent Presbyterial UCW Annual Gathering took place on Saturday, February 11, 2017 at Bothwell United Church. 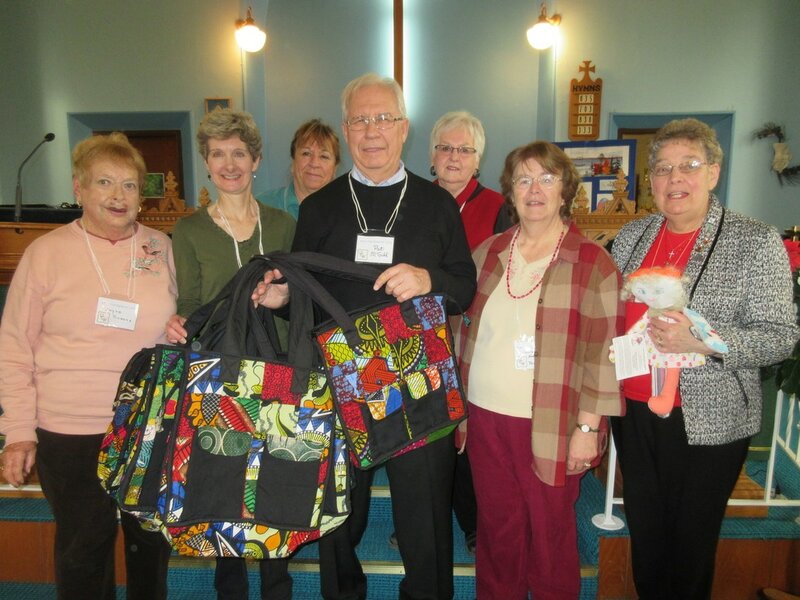 talked about the colourful African bags and aprons that have been displayed at UCW events. 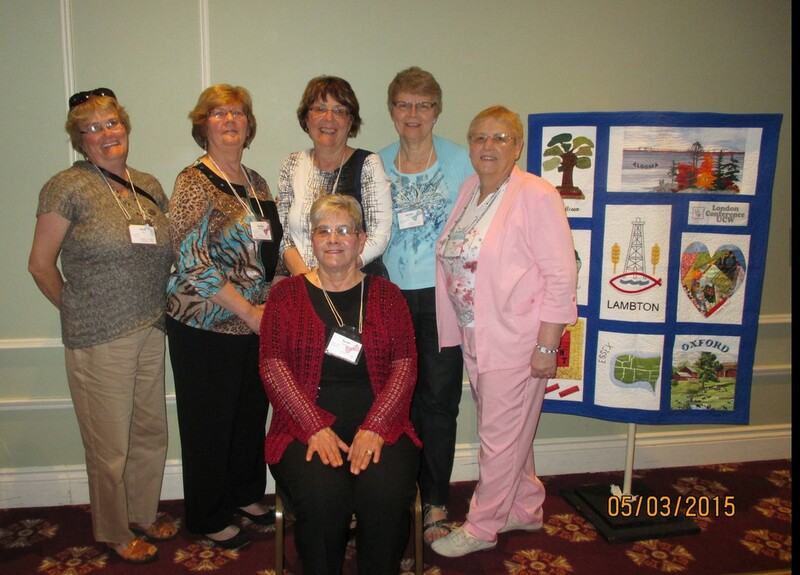 Also, we welcomed two UCW units from Elgin who will join in Kent Presbyterial events. 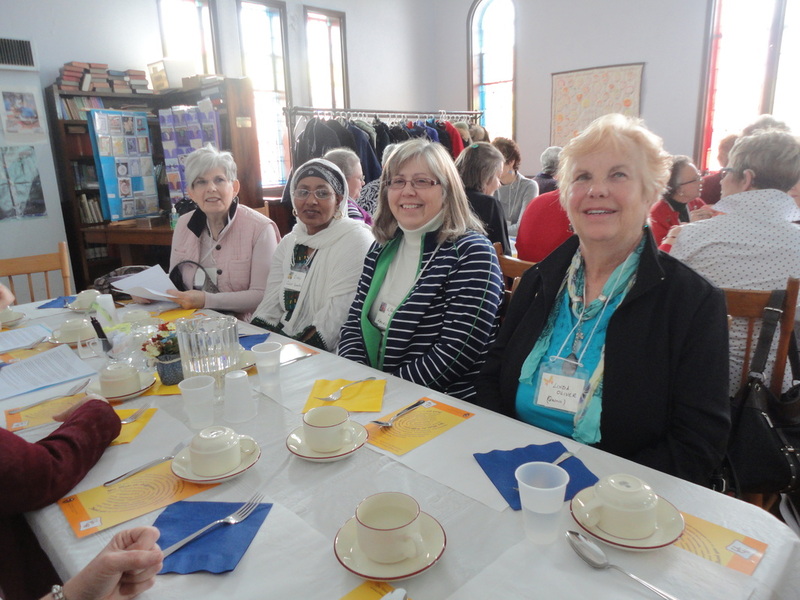 Registration was followed by a delicious soup and sandwich lunch. 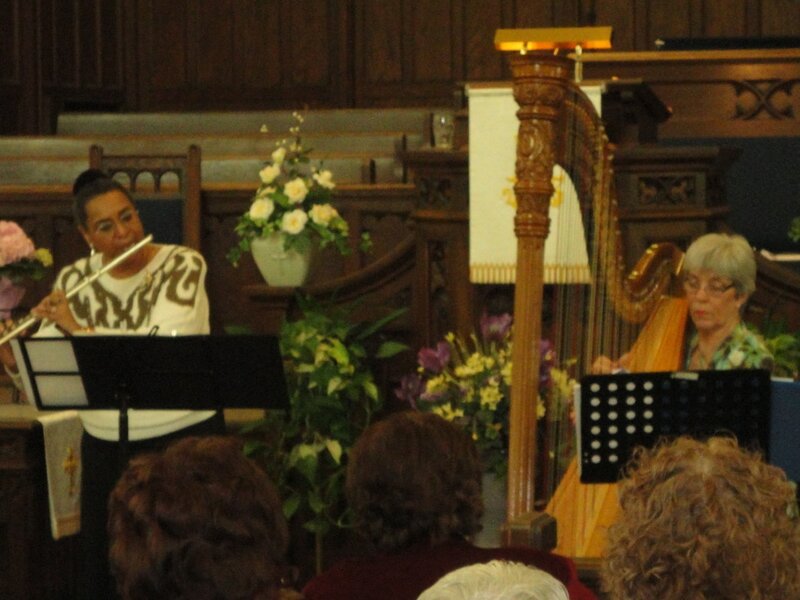 The afternoon began with singing and ended with music played on the harp and the flute. 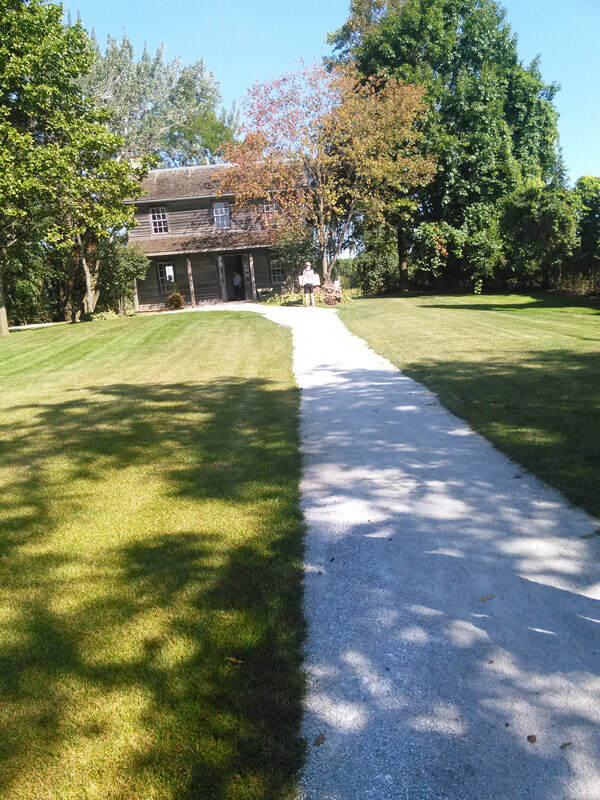 A heavenly afternoon. 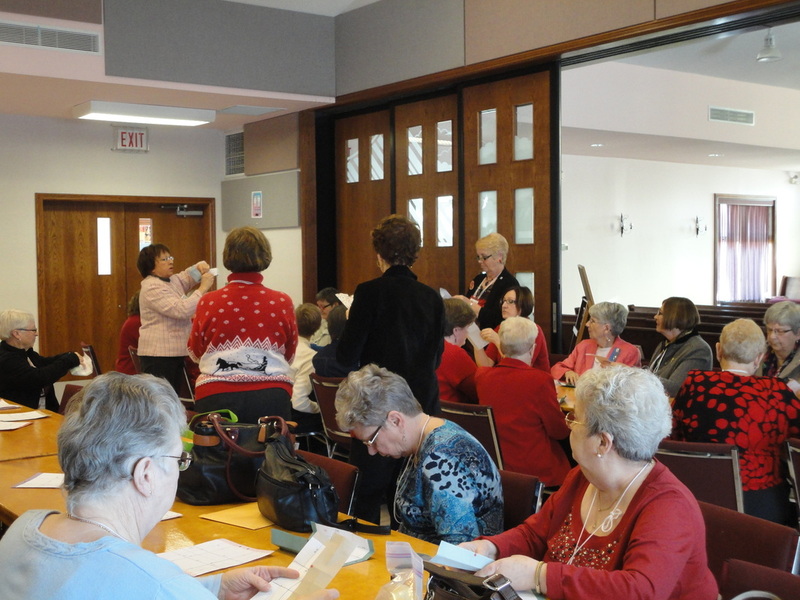 Click here to see the slideshow of the afternoon's activities. 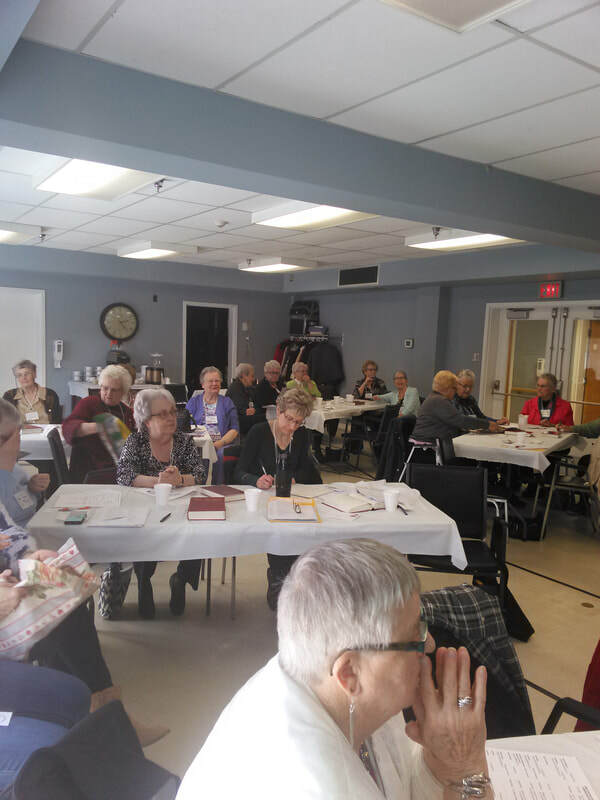 Kent Presbyterial UCW held its Fall Event on Tuesday, September 29, 2015. 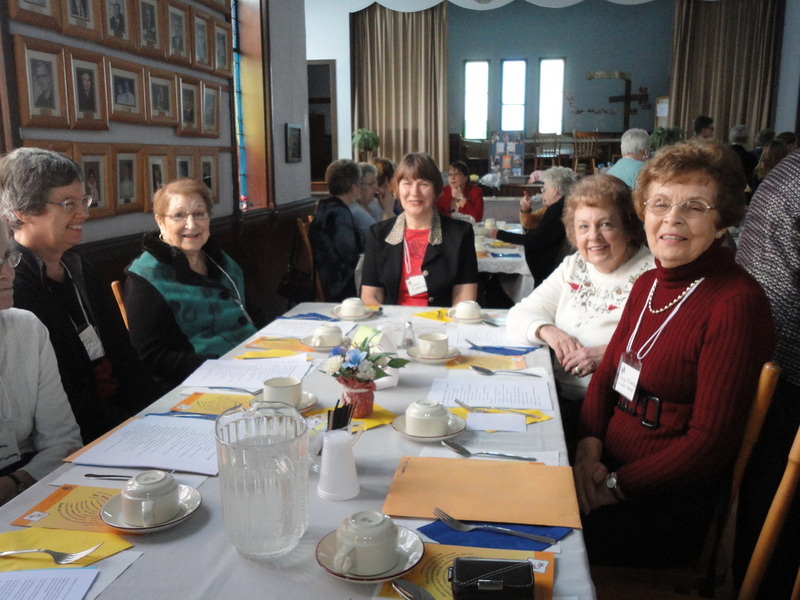 Delicious desserts were served at St. Andrew's U.C. in South Buxton. 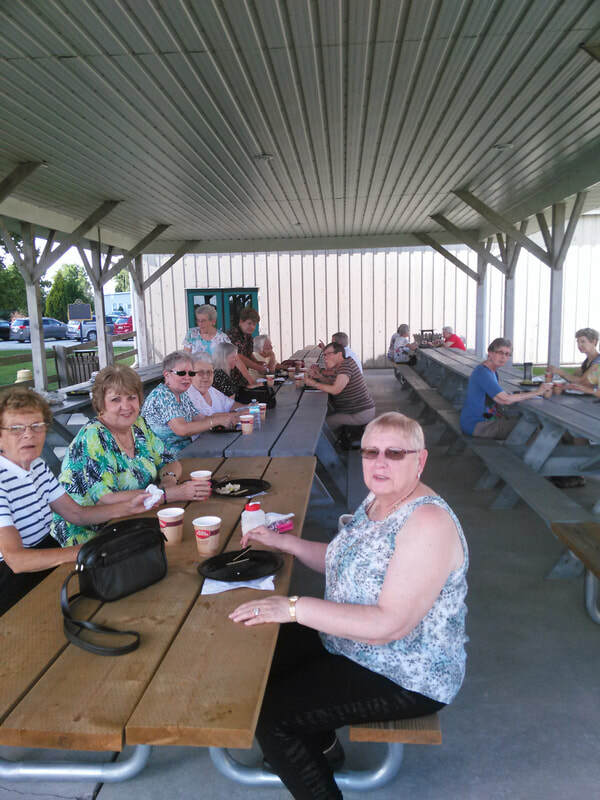 The everyone drove over to North Buxton to the Museum. 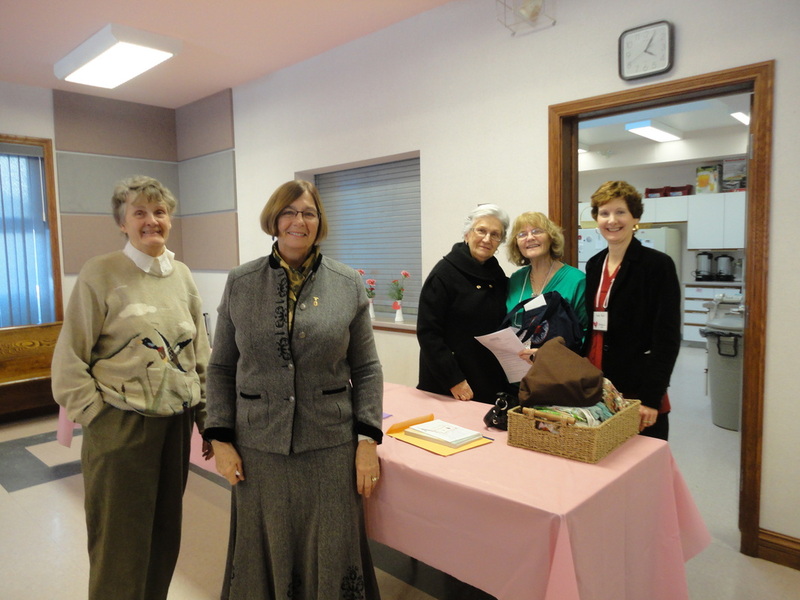 President Sharon brought the women up to date on current events and Carolyn Fraser talked about the Poverty initiative. 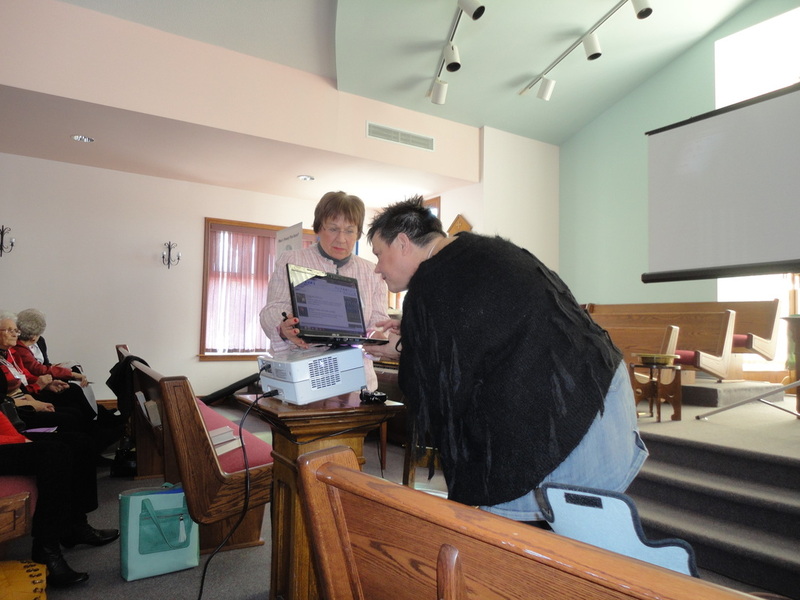 Joan Nichol presented a thoughtful worship and then Shannon Prince gave a very interesting overview of the history of the Elgin Settlement. Then everyone was free to wander around the museum. A most enjoyable afternoon. 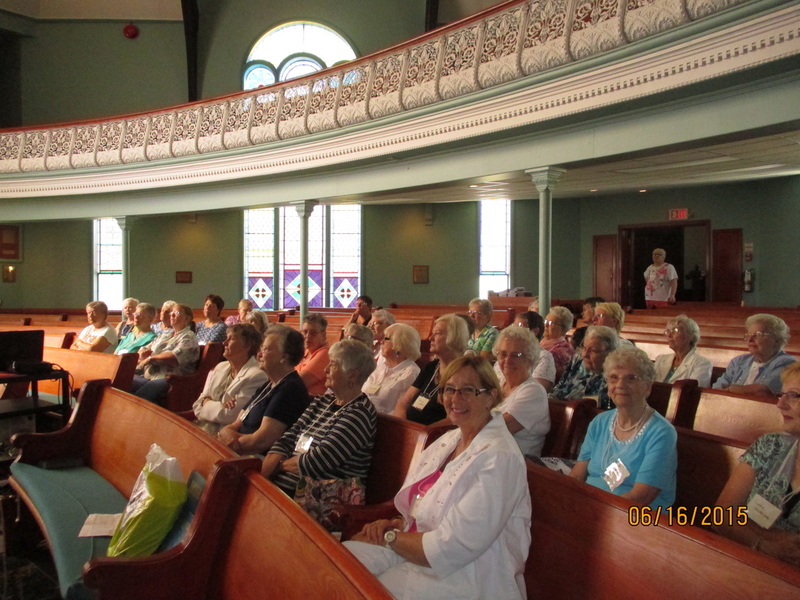 Kent Presbyterial UCW held its Day Away at Blenheim United Church on Tuesday, June 16, 2015. 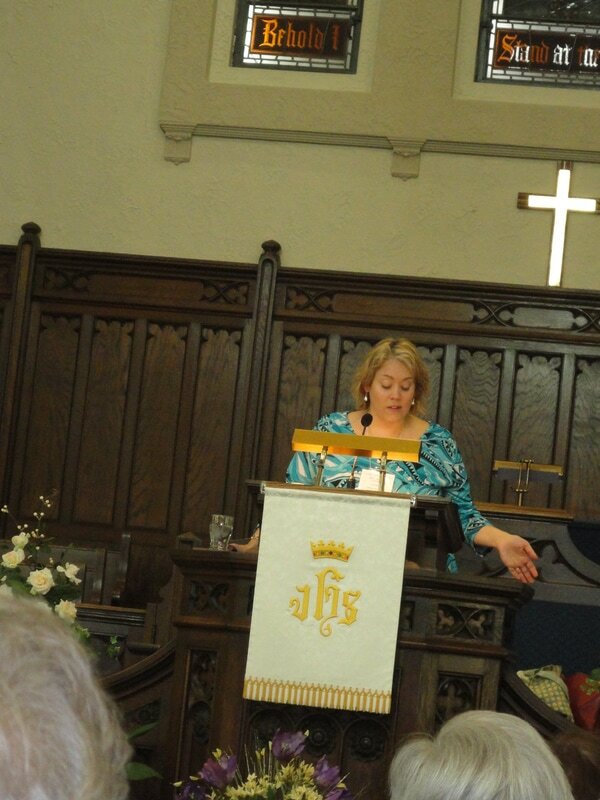 The guest speaker was Rev. 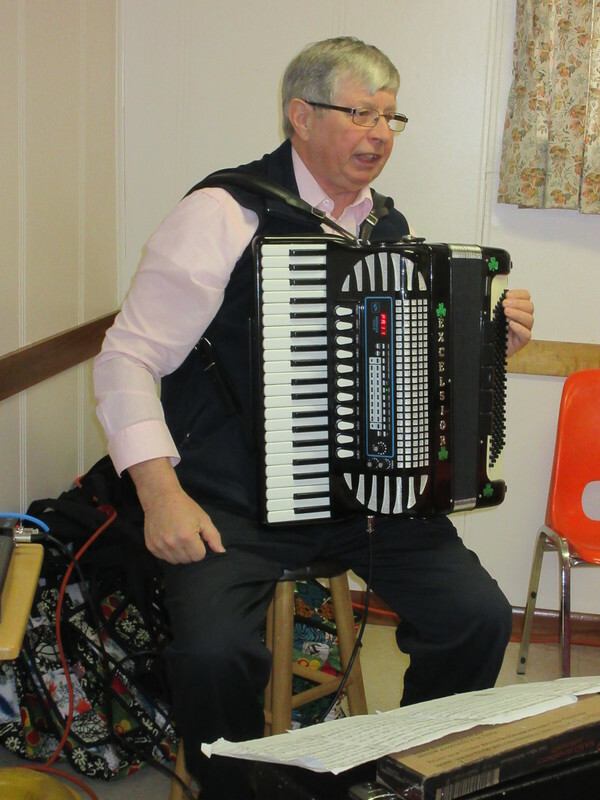 Mark Perry of St. Andrew's U.C. in Chatham. He talked about the new Habitat for Humanity build in Charing Cross. 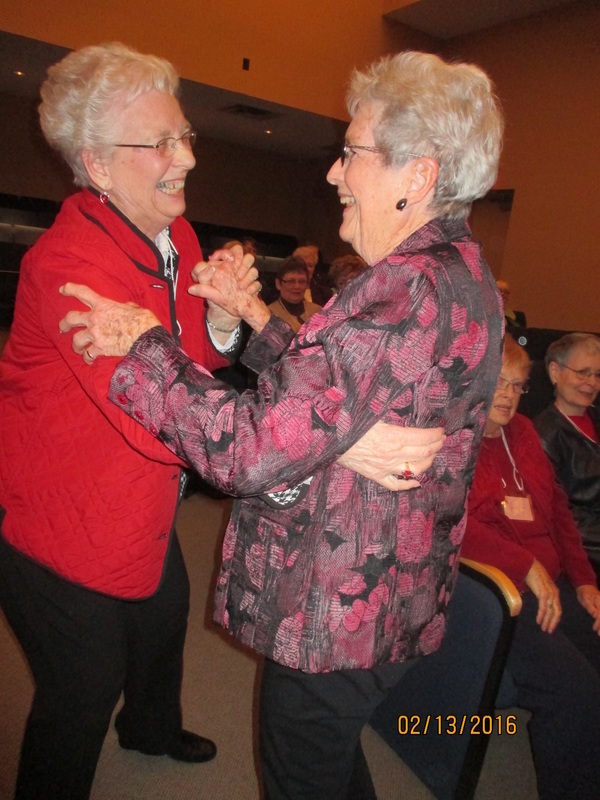 The Fall Event was held on Tuesday, September 30, 2014, at Merlin U.C. starting with dessert at 12:30 p.m.
Dr. Darrel Stewart spoke bout their mission trips with RayJon doing eye care. 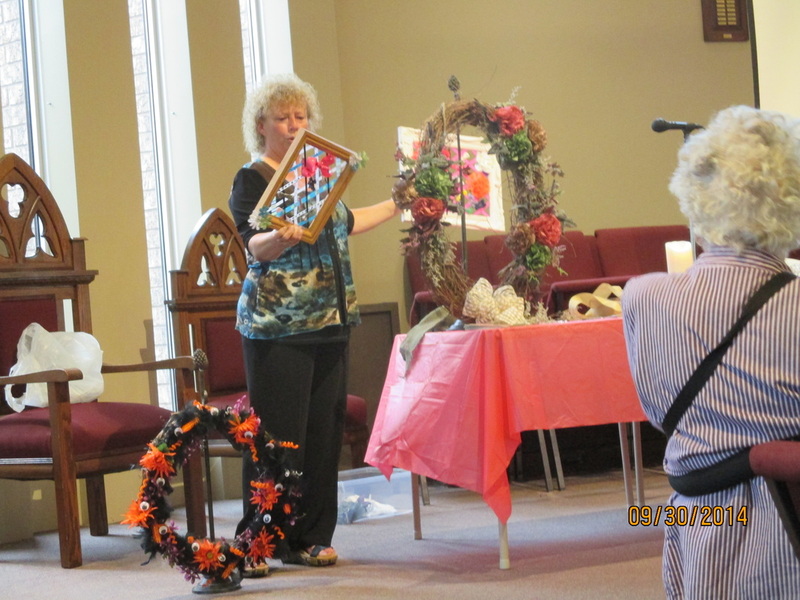 Laurie Glassford did a fall flower arrangement demonstration. 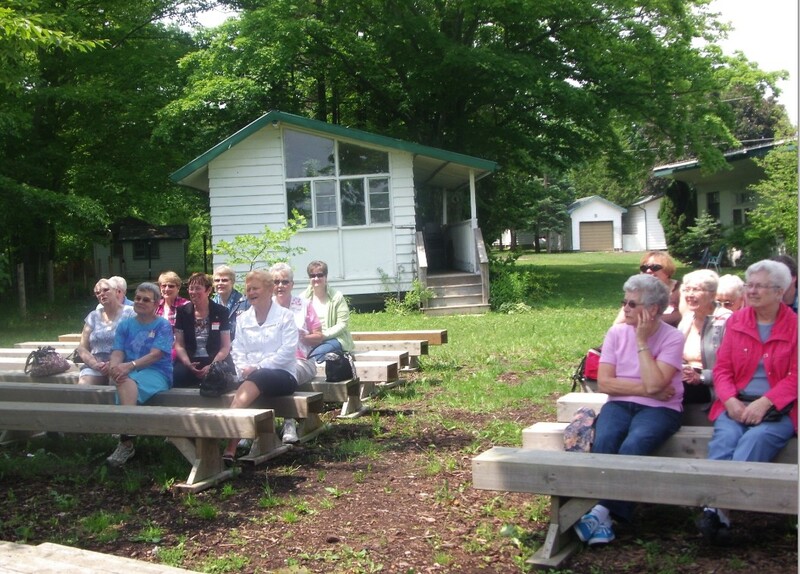 Kent UCW Day Away for all ladies took place on Saturday, June 7, 2014. 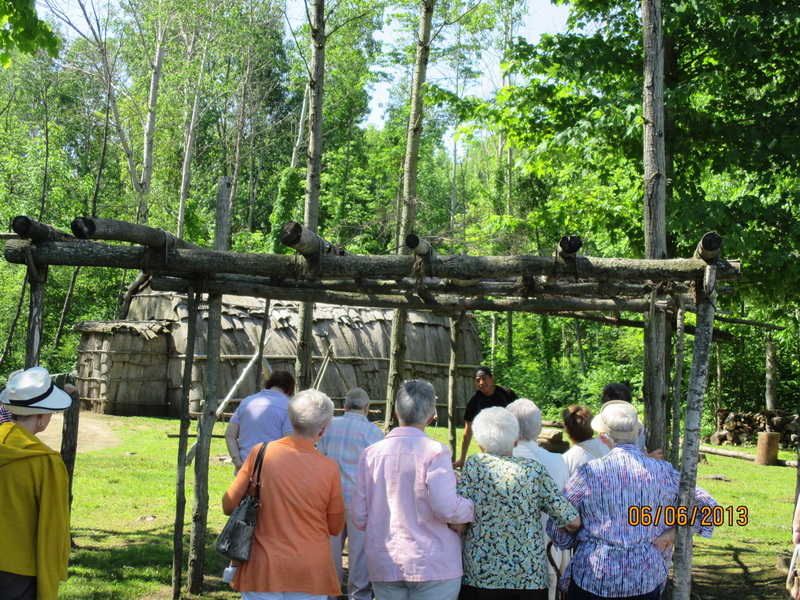 Twenty-four women came out to Moraviantown to enjoy a morning exploring the Indigenous Enviro-Education Centre. 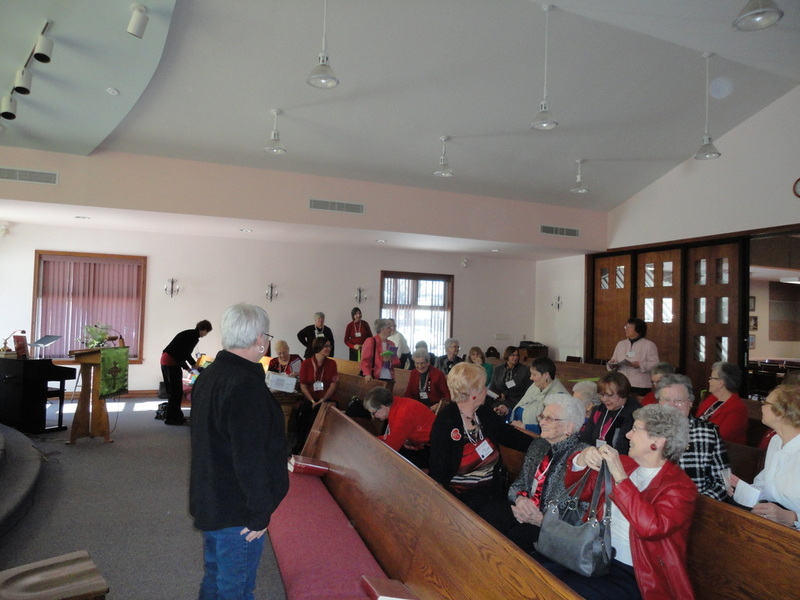 We met at 10 a.m. for snacks and coffee/tea before beginning our tour. Travis Snake, our leader, is passionate about teaching the ancient ways of his people and their respect for the environment and the creatures that live there. 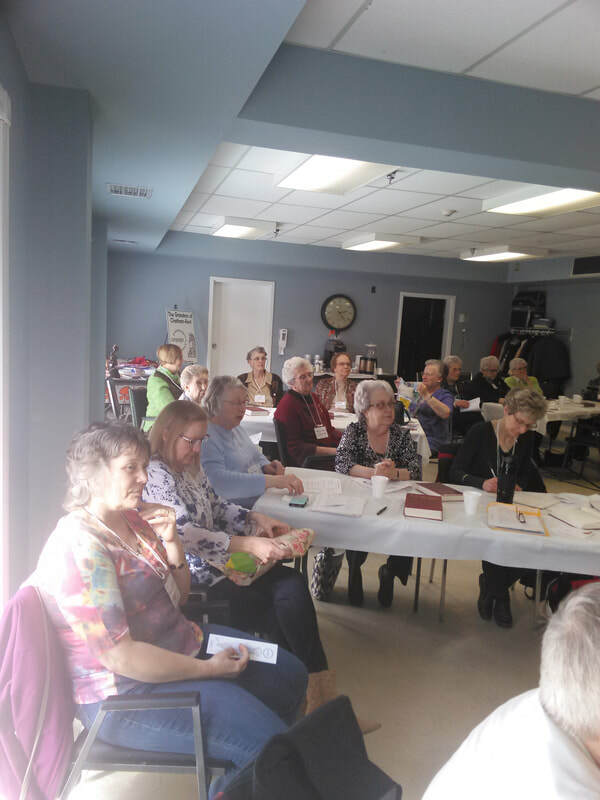 Fellowship and food at the new Moraviantown United Church was followed by an interesting presentation by Theresa Johnson about her natural salves and oils. She had some of her products for sale and did a brisk business. 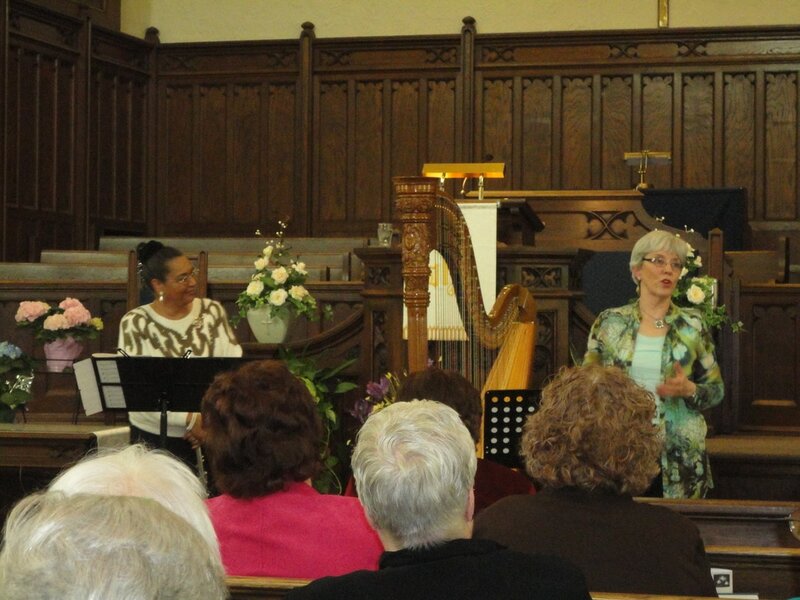 Susan Scamen then led us in worship in the sanctuary. 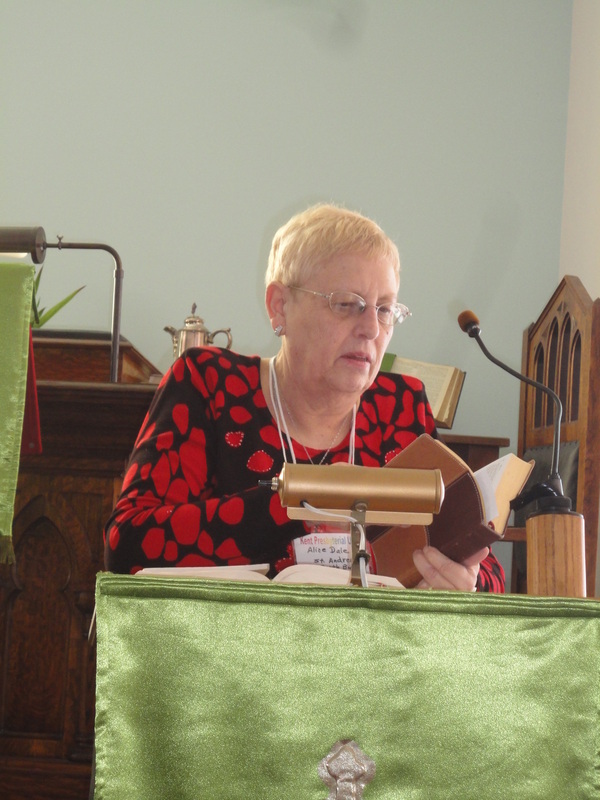 Nadine Whiteye gave an impromptu, but very moving, speech about how the new church came to be and about their struggles to keep going. Many of us in small congregations could relate. 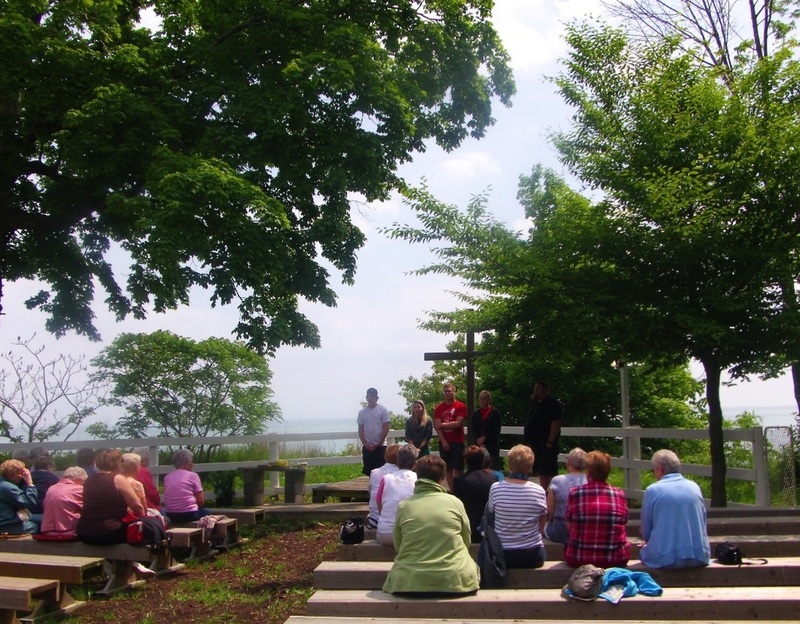 It was a beautiful day to be outside (even with the mosquitoes) with lots of learning, fun, fellowship, and worship. 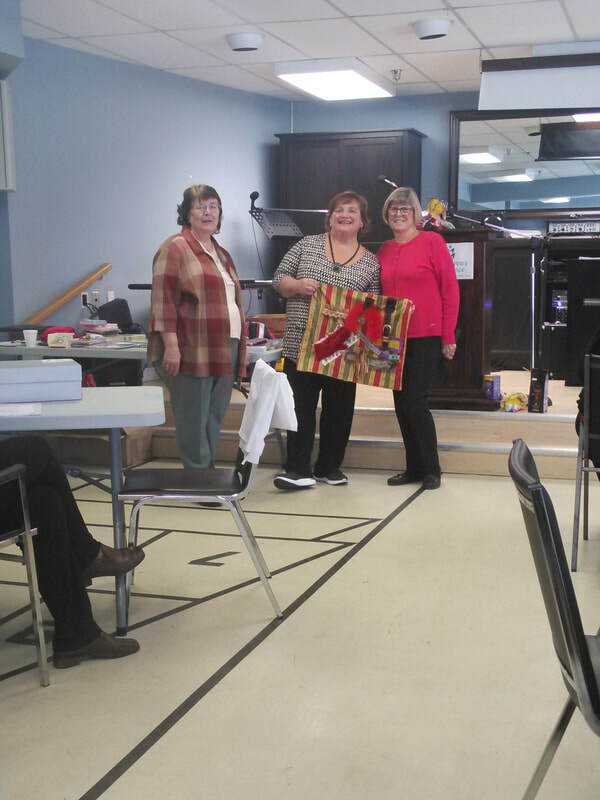 Thanks Sharon, Sandy and Susan for arranging it. Technology is wonderful when it works. 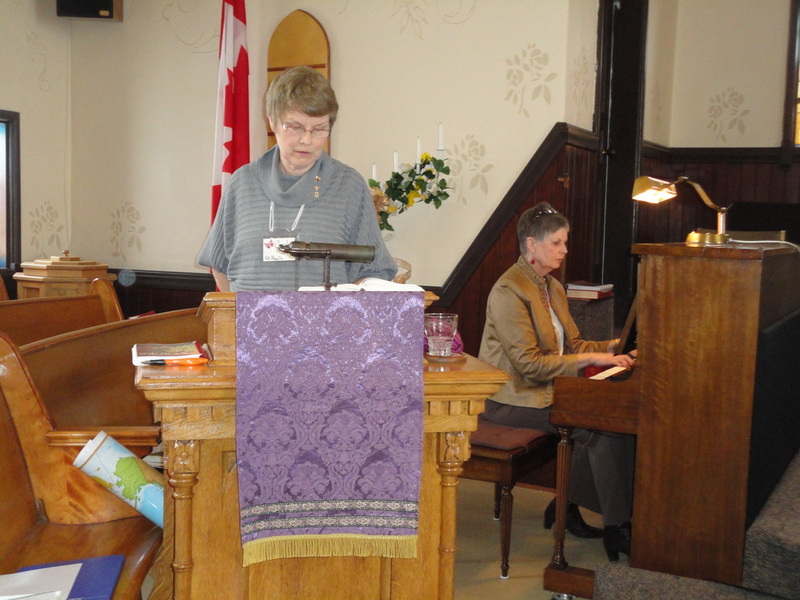 Alice Dale from St. Andrews, South Buxton, leads the worship. 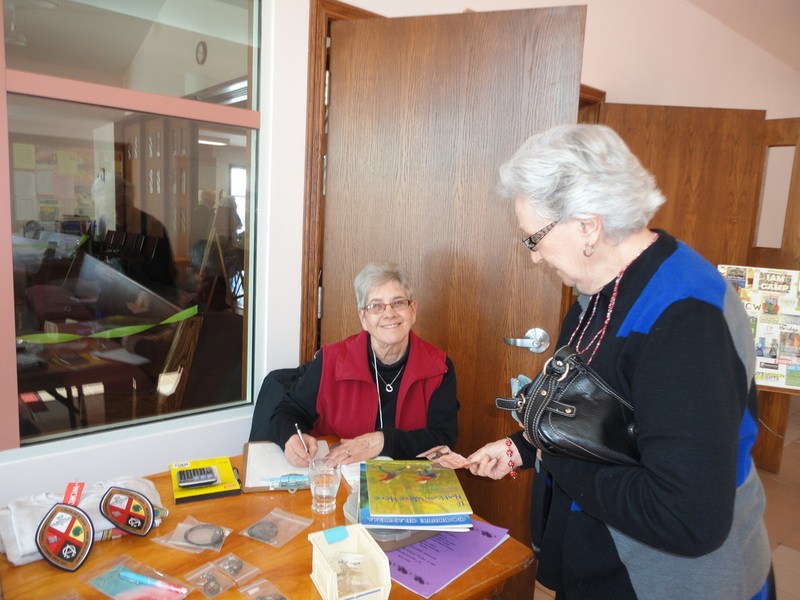 Susan Scaman selling her wares at the Resource Centre table. 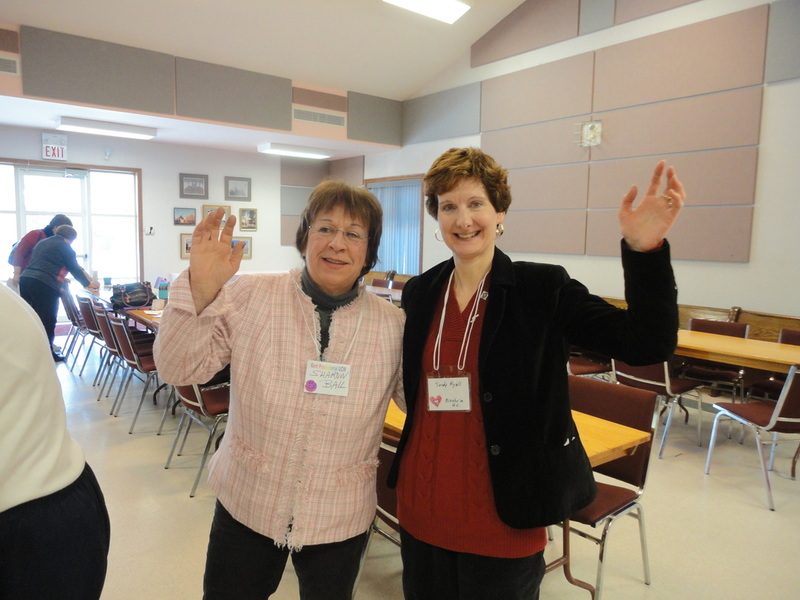 The two who organized a great day - President Sharon Ball and Secretary Sandy Ryall. 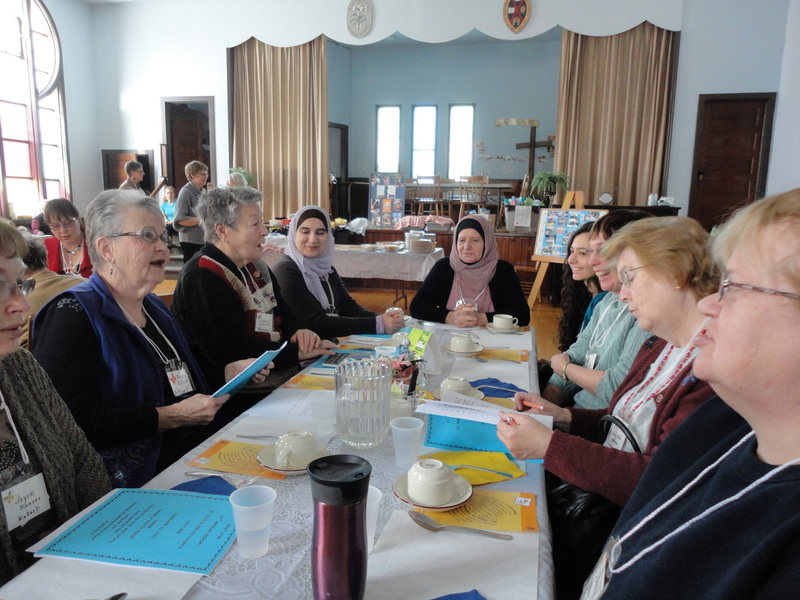 Theme - "Openness to the Spirit of the Creation"
Nearly 70 women attended the Annual Gathering at St. Paul's United Church. 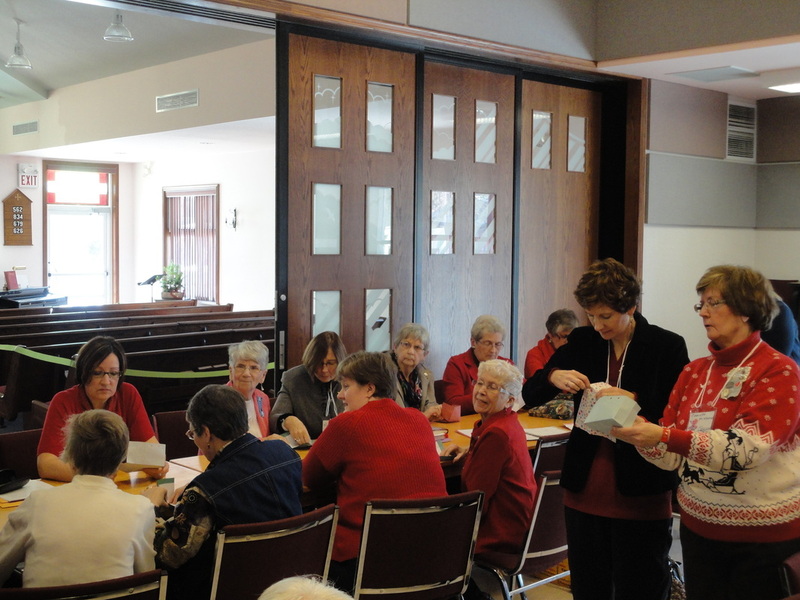 Following registration and a chance to check out the items from the Resource Centre, a delicious soup and sandwich lunch was served by the St. Paul's women. 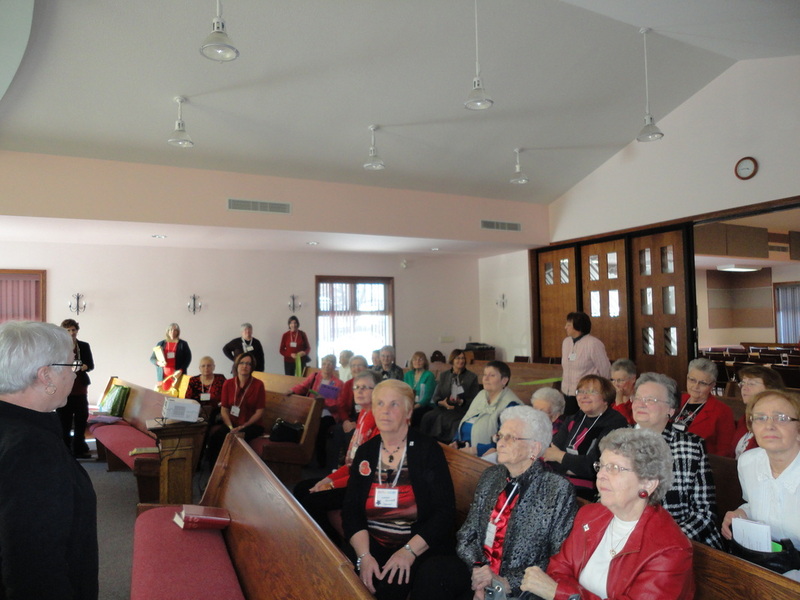 Our theme was 'Make a Joyful Noise' and we did that with singing and warm welcomes. 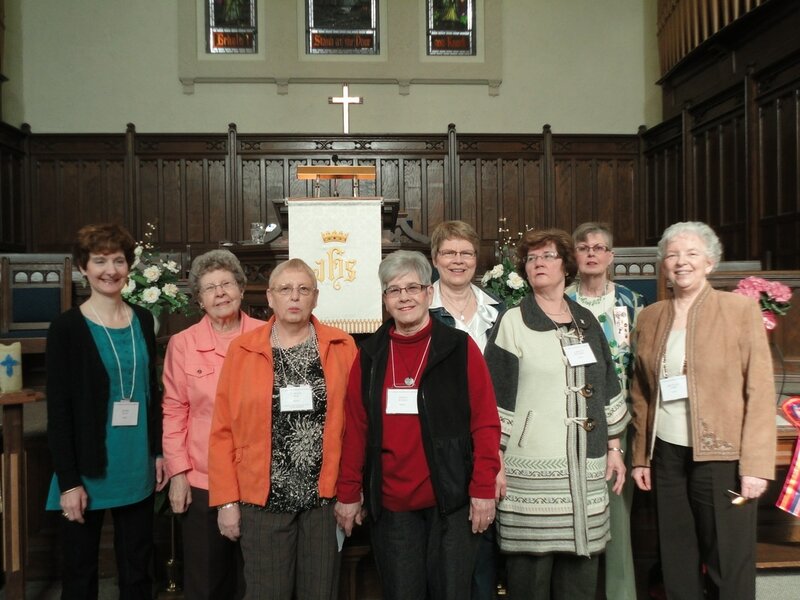 The Annual Report was presented which highlights the work done in the year by all of our women. 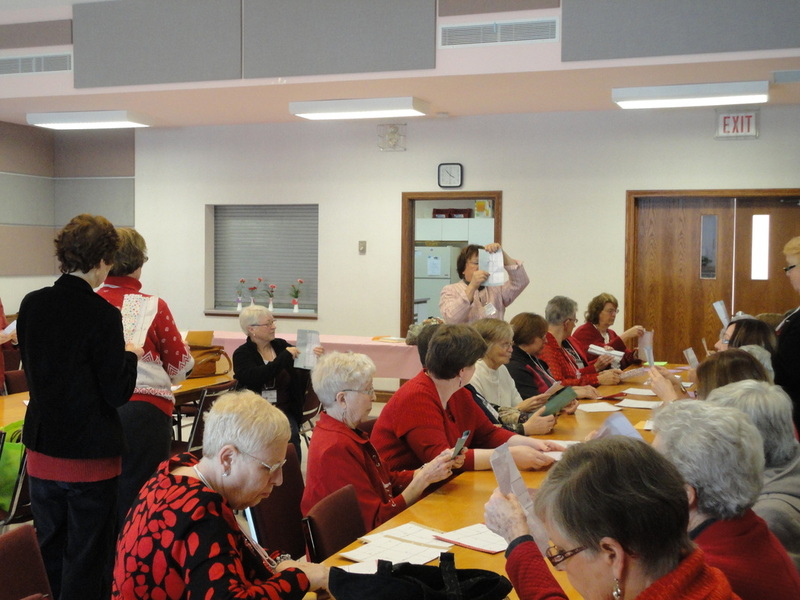 The Treasurer's report and the 2014 budget were given and approved. 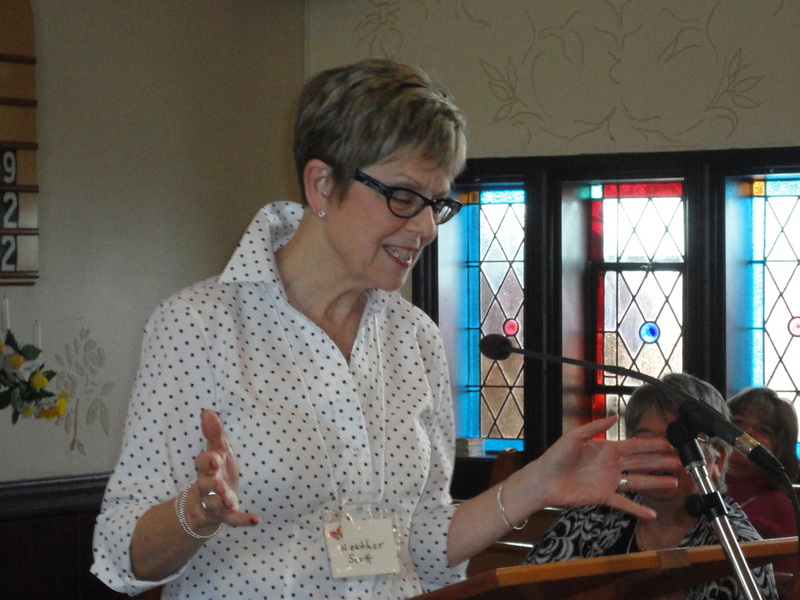 Laurie brought news of Kenesserie Camp. 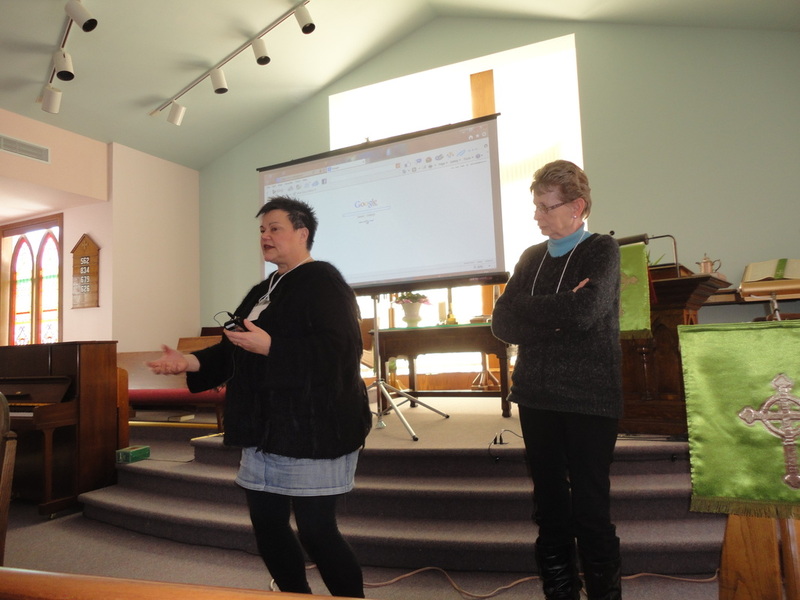 Two of our guest speakers talked about their experiences as immigrants to Canada. Giday, from Ethiopia, shared the story of her struggle to come to Canada two years ago with her two children after being in a refugee camp. She then had to learn a new language and new customs. 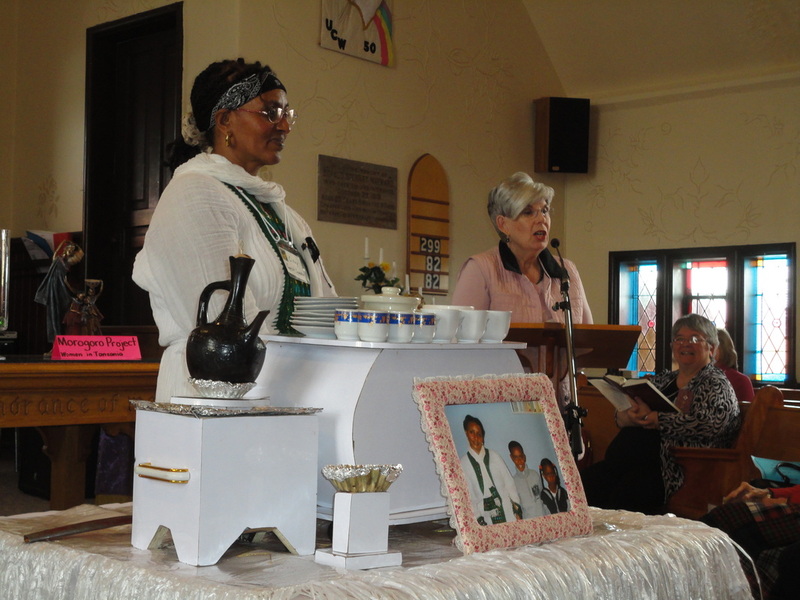 She had been a coffee seller in Ethiopia and she showed us how she roasts and grinds the beans and then serves the coffee in tiny little china cups with popcorn on the side. 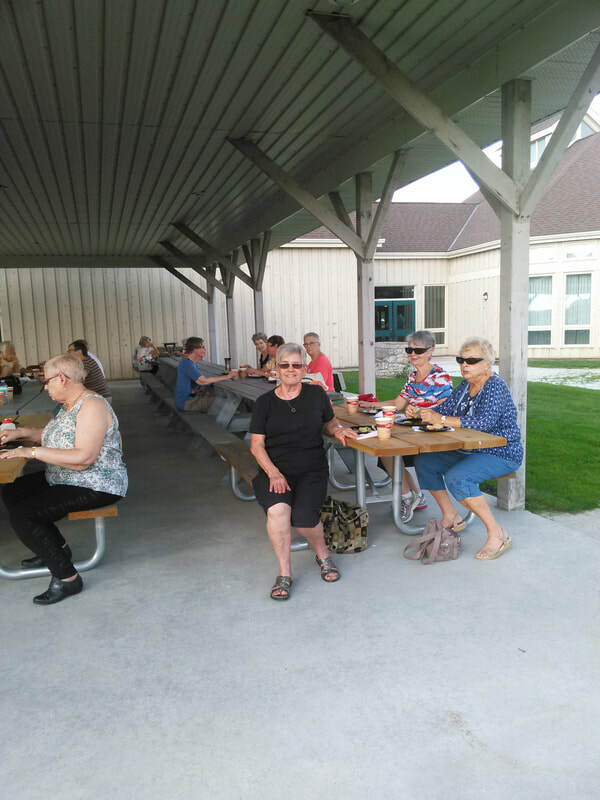 Her friend, Linda, told us it is delicious, far surpassing anything from Tim Horton's. 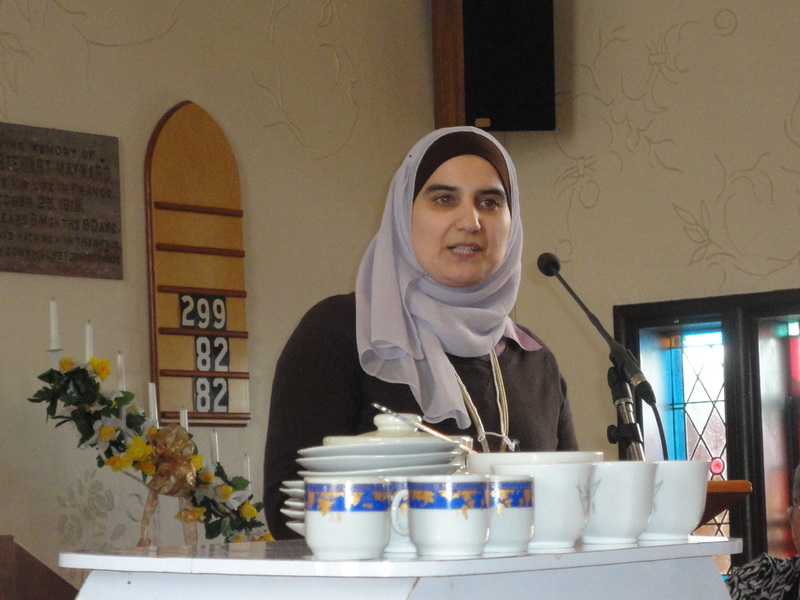 Samar was born in Lebanon, grew up in England, and then came to Canada about eight years ago. 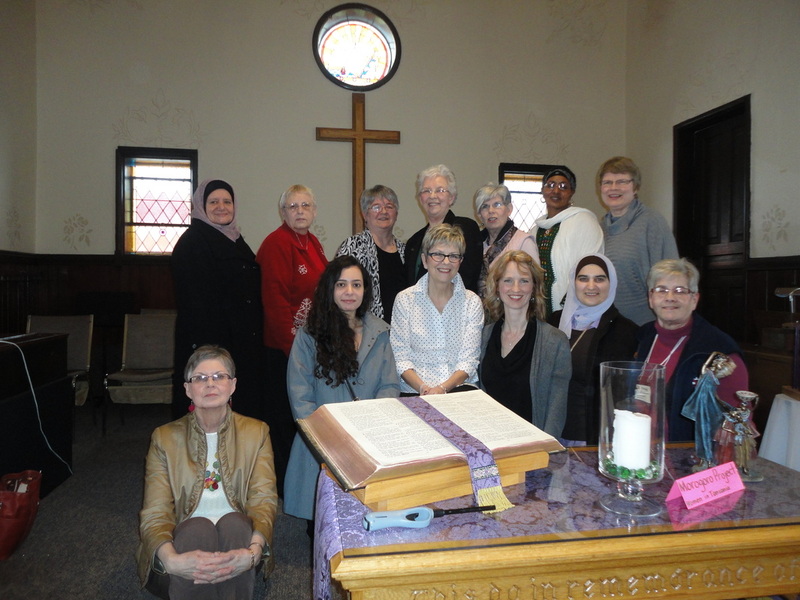 As a Muslin, she shared her customs and beliefs in an effort to show how we are all alike in trying to be good, faith-filled women. She explained why she wears a Hijab and showed us how to put it on. 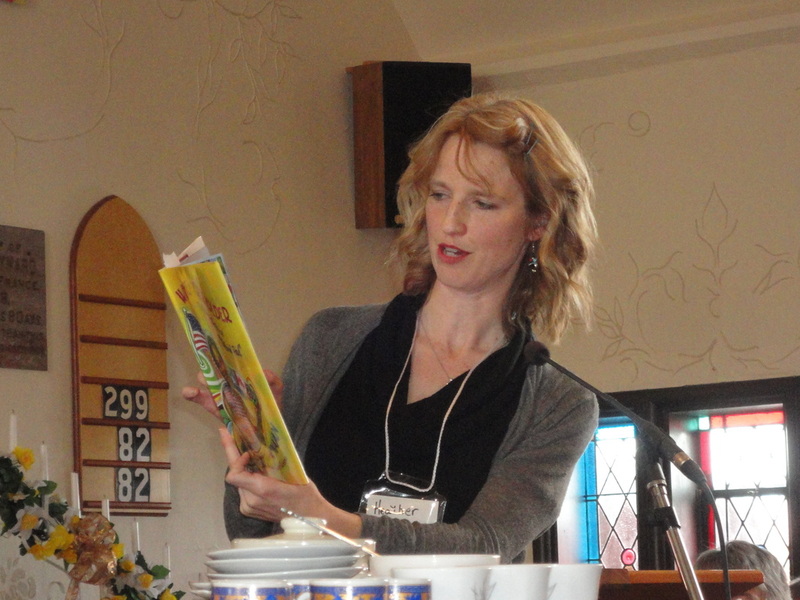 Heather was our third speaker and she told about working for one year in El Salvador. Like Giday, she did not speak the language and did not understand the customs. 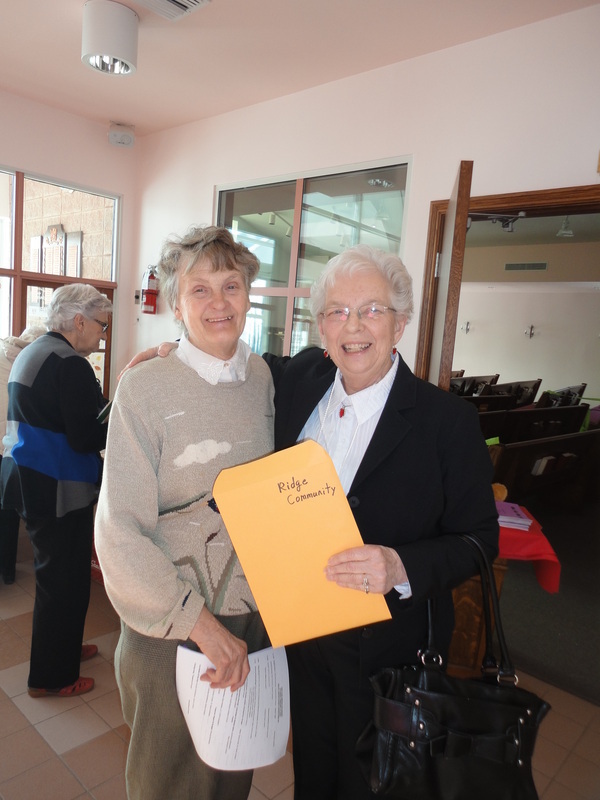 When she returned to Canada, she worked at Romero House in Toronto which helps people new to Canada. 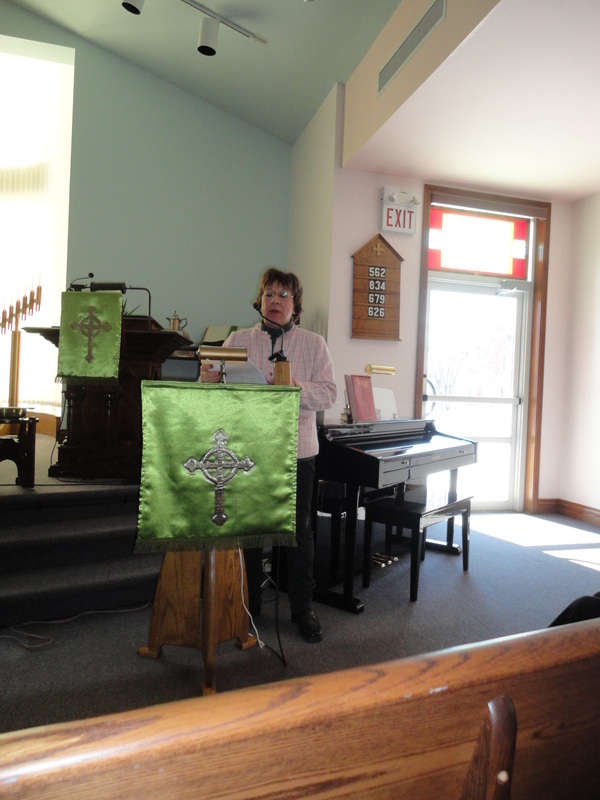 She told about two people's experiences coming to Canada to escape dangerous situations in their homelands. It is made very difficult for them by the amount of paper work required by our government. 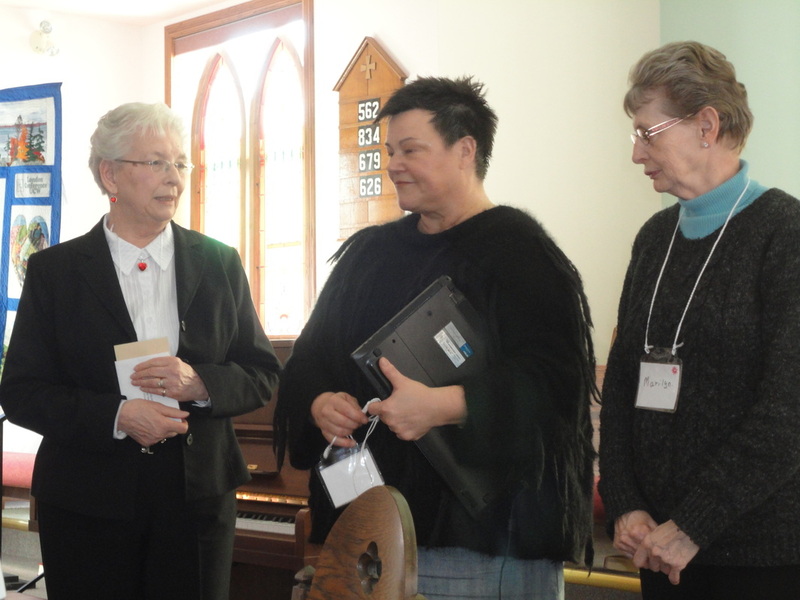 A skit was presented to tell everyone about the three events coming up which are hosted by London Conference UCW - The 51st Annual Gathering in Kingsville, April 14 & 15; Westminster Weekend, May 3 - 5; and, Summer Event, July 20. 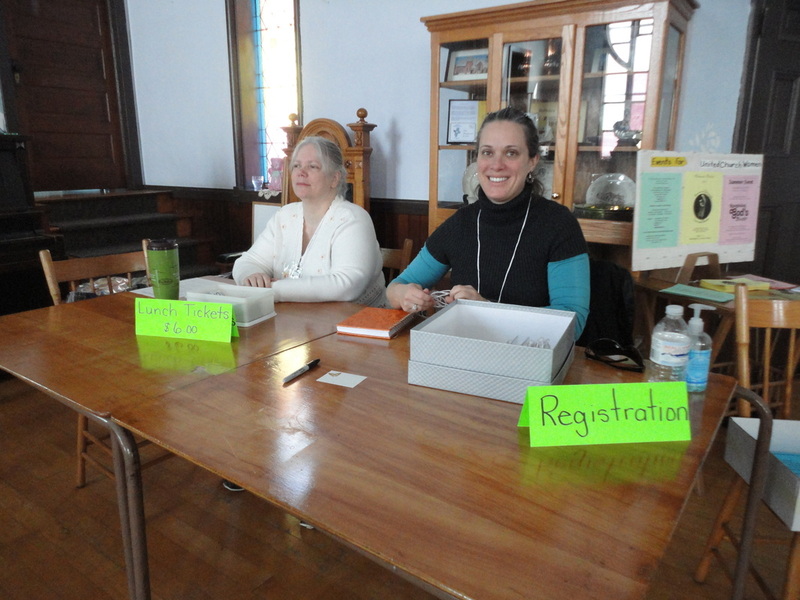 Your UCW President has information and registrations forms. 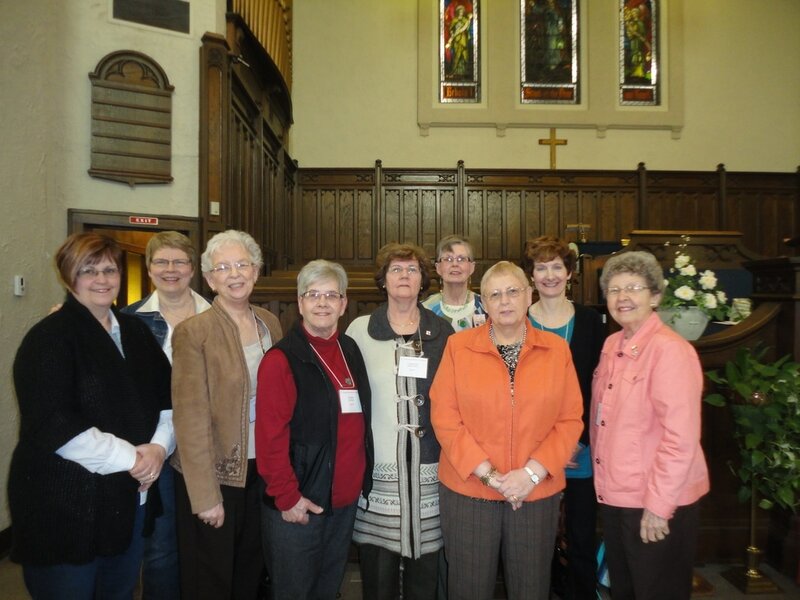 A moment of remembrance was observed to honour our UCW members who passed away in 2012. 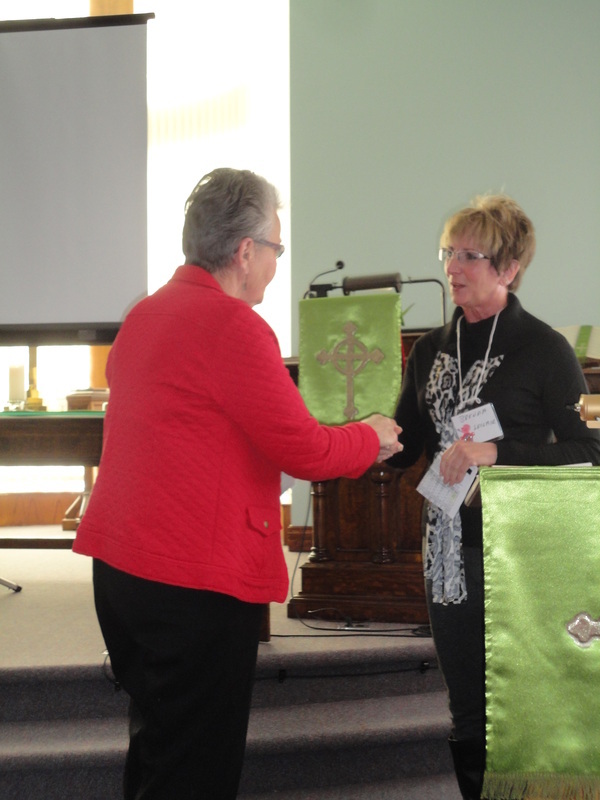 Our retiring President, Carolyn, was thanked with a gift from the United Church's new 'Gifts with a Vision' catalogue. 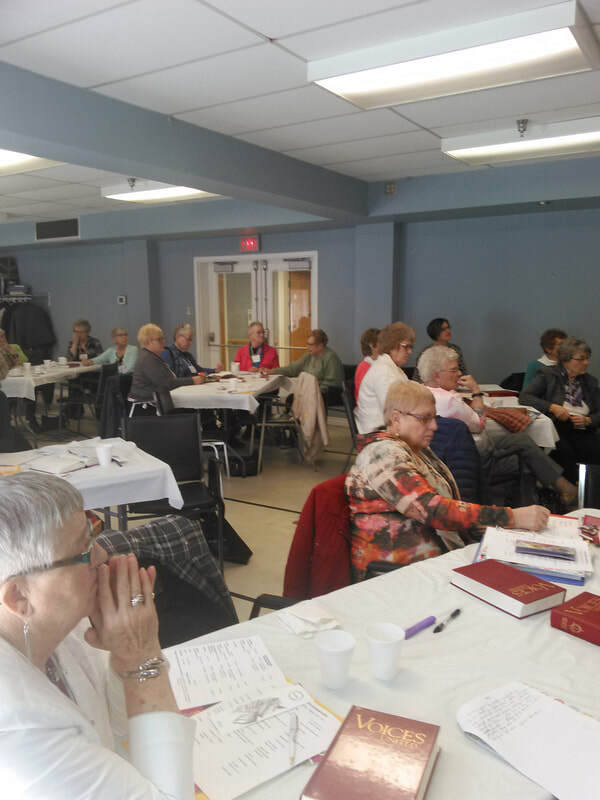 London Conference UCW President, Linda Fishleigh, was unable to attend, but sent a note to encourage us to think about where and how God is leading us into the future. Rev. Heather gave some reflections to end the meeting. Deborah and daughter Lennie welcome everyone to a great afternoon. Linda introduces Giday, our first speaker, who emigrated from Ethiopia. Samar, our second speaker, was born in Lebanon, grew up in England, and then immigrated to Canada. 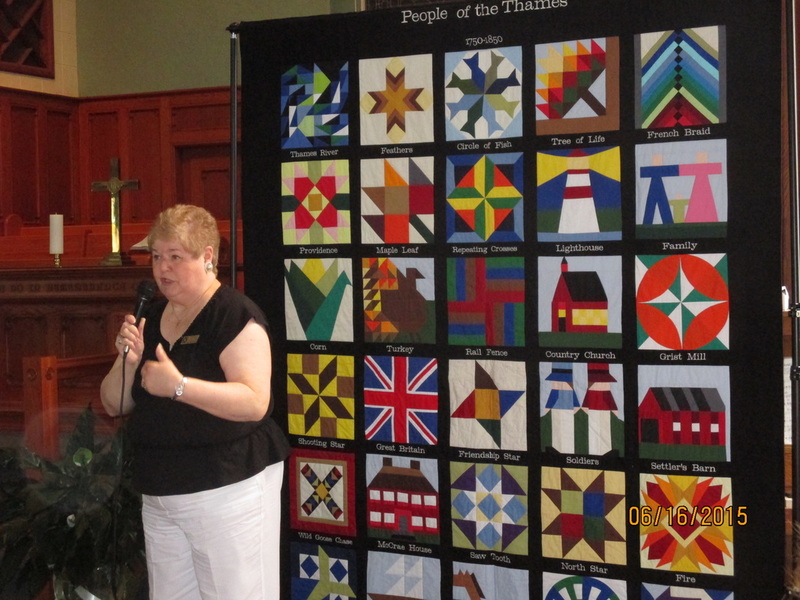 Our third speaker, Heather, told about her work with immigrants in Canada. 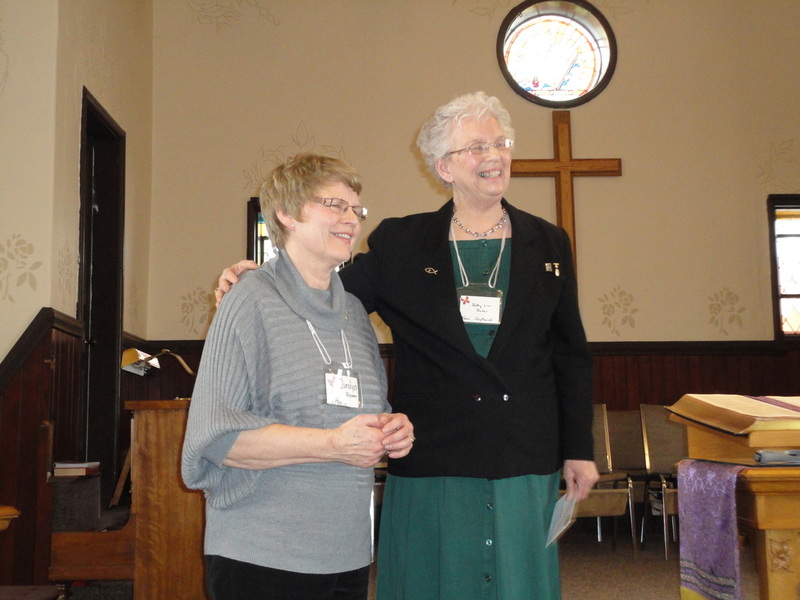 President Carolyn and Past President Betty Lou saying their farewells. Rev. Heather ended the afternoon with meaningful reflections. 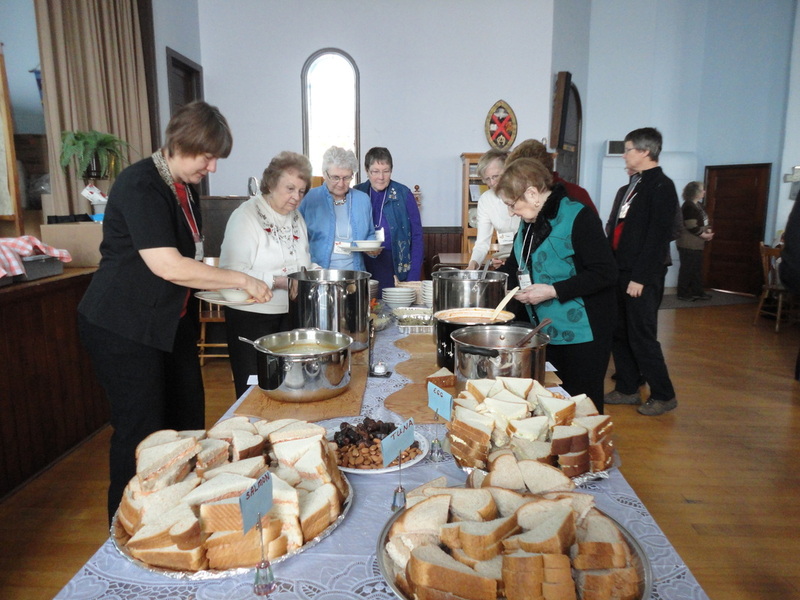 No UCW event is complete without wonderful food.